Whooping cranes have struggled to survive various adversities since man came to the North American continent. First it was the American Indians who killed them and collected their eggs for food and feathers. It is believed however that the Indians did only minor harm because their hunting equipment was primitive. Problems increased tremendously for the whoopers after the Europeans migrated to the continent. The new settlers had guns and hunted the cranes for food. But their most damaging tools were their shovels, axes and plows. These tools were used to destroy millions of acres of whooping crane habitat. Settlers drained wetlands with their shovels, cleared forest with their axes and plowed the former wetlands and forest for agricultural purposes. Yet, with all the killing and habitat destruction some of the whoopers survived. Only 14 remained in the wild in 1940 but the population slowly increased to 304 in 2014. Fortunately, the majority of these endangered whooping cranes have made it through some serious adversities during the past decade. The most recent hazard was the barge accident in the Houston Ship Channel that dumped tens of thousands of barrels of oil into Galveston Bay. The spilled oil followed the Gulf of Mexico currents westward down the coast and reached the Matagorda Island unit of Aransas National Wildlife Refuge. Oil killed wildlife and damaged the environment in some of the gulf waters, wetlands, estuaries and beaches, but not on Aransas Refuge. Hundreds of oil spill cleanup workers were deployed to Matagorda Island to remove the oil due to the presents of whooping cranes and other endangered wildlife. According to the U.S. Fish and Wildlife Service, the response team worked with great care scraping thin layers of oil-drenched sand away with shovels and removed it from the beach. Aransas Refuge Manager Sonny Perez advised Friends of the Wild Whoopers (FOTWW) that “none of the oil got into the marshes or bay systems on Matagorda Island or any other part of the refuge.” However, on other areas of the Texas coast many other wild birds, turtles and porpoises were killed. The latest information available from NOAA National Marine Fisheries Service teams reported: “21 dolphins and 4 turtles stranded. Most of these are in the Galveston, TX area but reports from Matagorda Island are increasing. All of the dolphins were dead, two turtles were captured alive and are being rehabilitated. Most of the animals were not visibly oiled but necropsies are still underway. Approximately 150 dead birds have been reported in the Galveston area and 30 in the Matagorda area.” FOTWW has asked for a final tally of dead animals. Aransas Refuge Assistant Manager Felipe Prieto told FOTWW that “cleanup of oil on Matagorda Island beach is completed but we are closely monitoring to determine if more oil washes onto the beach.” Prieto also advised, “We believe all of the whooping cranes have departed Aransas National Wildlife Refuge and are currently migrating on their way to their Canadian nesting grounds. We have not observes any whoopers on the refuge in several days”. According to Wade Harrell, U.S. Whooping Crane Recovery Coordinator, “This season we documented four whooping crane mortalities on and around Aransas NWR.” “ FOTWW understands that except for the four documented mortalities, all of the estimated 304 whooping cranes survived the winter on Aransas Refuge. Some of the whoopers have already reached Wood Buffalo National Park in Alberta, Canada and will soon begin building their nests according John McKinnon, Wood Buffalo National Park. This is all great news for those who support the only remaining wild, self-sustaining population of whooping cranes on the planet. Whooping cranes dodged another even larger disaster known as the “BP Deepwater Horizon oil spill”. In 2010 this horrific accident killed 11 people and spilled over four million barrels of oil into the delicate ecosystem of the Gulf of Mexico. While this disaster did not have any known effects on whooping cranes it did have catastrophic effect on other birds, fishes, porpoises, shell fish, turtles and other wildlife species. Fire boat response crews battling the blazing remants of the offshore oil rig Deepwater Horizon off Louisiana. Fortunately, whooping cranes have not been harmed by two of the largest oil spills in the Gulf of Mexico in recent memory. FOTWW believes however that we must remain vigilant because a hurricane could possibly push some of the off shore submerged oil onto beaches and wetlands along the coast. And there is always the danger that some vessel loaded with oil or chemicals navigating along the Intracoastal Waterway could have an accident. The Intracoastal Waterway is located immediately adjacent to Aransas Refuge for about 17 miles. Then there is the lingering worry about the abandoned and capped, but leaking oil and gas wells. According to an Associate Press news story “there are over 27,000 oil and gas wells within the Gulf of Mexico that have abandoned and have been capped to prevent the leakage of oil and gas from them. About 3,500 of these wells are oil and gas wells that have been “temporarily abandoned” and have been capped in a less stringent manner than other wells which were “permanently” capped. Neither industry nor government checks for leaks at the oil and gas wells abandoned in the Gulf of Mexico since the late 1940s. Abandoned wells are known sometimes to fail both on land and offshore. It happens so often that a technical term has been coined for the repair job: “re-abandonment.” Collectively these wells may be allowing tremendous quantities of waste onto the gulf shores and causing harm to fish and wildlife. Another major threat to whoopers and other wildlife on Aransas Refuge is hurricanes. In August of 1965 a major hurricane slammed into Matagorda Island causing significant damage. Mercifully the whooping cranes were still at Canada’s Wood Buffalo nesting grounds getting ready for their southward migration. 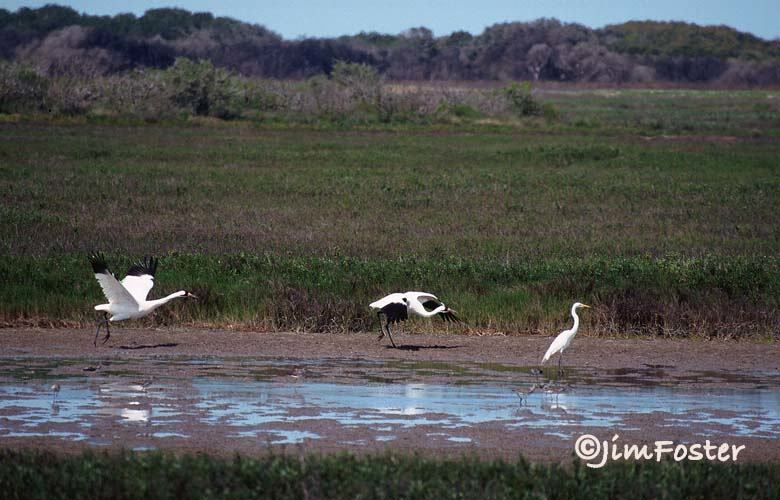 Increasingly, however, late-summer storms are occurring and may happen when whooping cranes have arrived on Aransas. Aransas has both a “Hurricane Plan” and an “Oil Spill Plan” according to Aransas Refuge Assistant Manager Felipe Prieto. So, the refuge officials are at well informed on what course of actions they will take in case of emergencies. Such plans can reduce damages when emergencies occur. “Drought is an ongoing major adversity for Aransas Refuge. The refuge has been short on rainfall for the past three years” advised Refuge Manager Sonny Perez. Fresh water is necessary for a healthy environment on Aransas National Wildlife Refuge. In fact the onset of a prolonged drought in Texas in the fall of 2008 caused serious problems for the Aransas/Wood Buffalo flock. The Aransas Refuge gets much of its fresh water from the Guadalupe River. Fresh water maintains the salinity of the coastal wetlands and allows for the production of blue crabs, the whooping crane’s major winter food. The prolonged drought and the diversions of Guadalupe River water allowed by the Texas Commission on Environmental Quality resulted in an increased salinity of water around the Aransas refuge. Tom Stehn, former U.S. Whooping Crane Coordinator contends that the salinity changes devastated the local population of blue crabs and led to the death of at least 23 whooping cranes during the winter of 2008–09.